Bitter Gourd Stir Fry or Karela Bhaji Recipe is extremely popular in my house. Especially if my sister or mom makes it! Here is my favourite version with coconut milk to make it more delicious. Interesting fact about bitter gourd is it is a fruit not a vegetable. It is very good for pregnant women because it controls blood sugar levels. Although suitable for all three dosha’s, it is most beneficial for Kapha dosha. Nutrients: Vitamin C, A, B1, B3, B5, B6, Calcium, Iron, Zinc, Potassium, Phosphorus, Manganese and Magnesium. There are approximately 32 active phytochemicals in bitter gourd such as carotenes, lycopene, lutein and zeaxanthin, GABA. Bitter melon is suitable for all 3 dosha’s (VPK) although it has a strong bitter taste. Cooked bitter gourd cleanses the liver and kidney. It helps the liver to purify the blood. It helps in maintaining normal level of triglycerides and cholesterol in the liver and blood. Bitter gourd juice combined with Trikatu (combination of ginger, long pepper and blackpepper) can get rid of parasites and worms in your body. It is a free radical scavenger. It has the ability to stimulate digestion and peristalsis of food through colon. Assists in ingestion, constipation and hemorrhoid. It is popular because it increased glucose uptake, and reduces blood sugar levels in type 2 diabetes. It get rids of excess mucus or phelm from the body. Bitter gourd is also considered to be a diuretic and mild laxative. It makes you feel lighter. It also rekindles digestive fire and works as an appetizer. It reduces the amount of uric acid in the blood. 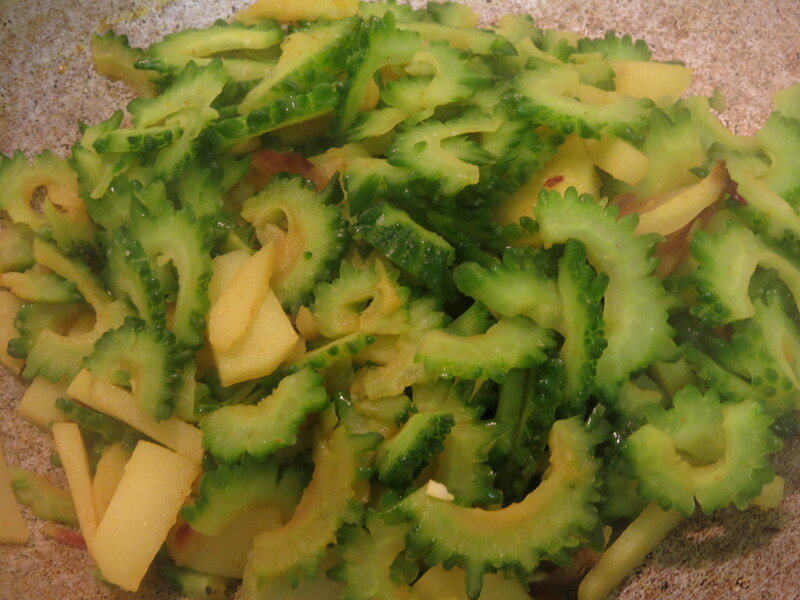 As mentioned Karela or bitter gourd cleanses liver and purifies the blood. For this reason it is extremely beneficial for the skin to get rid of blemishes, acne and skin infections. Due to its ability to assist the kidney and high level of phytonutrients it is also helpful to get rid of kidney stones. Cut the Bitter melons along length and remove seeds. Slice the bitter melon thinly. In a bowl add water, salt and lime juice. Add the bitter gourd and leave to soak for 15 mins and wash thoroughly with warm water. This helps reduce the bitterness. On a frying pan, add the sunflower oil and whole cumin seeds. When cumin seeds sizzles lightly, add onions and green chilies. Fry till light golden. Now add the bitter-melon and potato. Cook until bitter melon is soft. Enjoy Bitter Melon with rice and dal. Thank you for the recipe. I really love eating this bitter gourd. I love it too! Try scoping out the inner seeds – leaving the gourd as is. Then stuff with gourd with shredded carrots, peas and sweet potato. I will soon share a recipe.